"You know that great feeling when you know somebody loves you? That's just what I need, because I'm a really good kitty who loves to be loved. My name is Camila, and I'm looking for my special person - the one who can give me my forever home." "A very kind person brought me in to Great Plains after she found me wandering outside. I was in a lot of pain at that time, because I hurt by back leg a while before that. But the Great Plains staff has taken such good care of me. I've been here a while, but that's only because they're getting me ready for my forever home. You see, I have a few special things about me. First, as I mentioned, I had a hurt back leg. Well, that's not a problem anymore because I am now what all the staff and volunteers affectionately call a tripod! I had my leg amputated in April, and now I have no problem hopping around! I'm also special because when I came in, the staff noticed I was having trouble seeing. Since then, I've lost most of my vision. But, if you watch me explore a new place, you'd never know the difference! They call me the biscuit maker because that is my BEST talent. Whether I'm making biscuits on you or in the air, it's my favorite thing in the world to do. The best times are when I'm getting petted or held - then I'll make biscuits all day long for you! My foster mom says I'm the sweetest kitty she's ever met. I take that as quite the compliment! Speaking of petting, you'll notice I have beautiful long fur - it might look black to you, but I assure you, I've got style in my fur. It's an ombre of colors - starting with a smoky black around my face and transitioning in to a chocolaty brown near my belly. I am very beautiful if I do say so myself! So what do ya think? I'm a pretty great catch - especially if you're looking for a cuddly loving experienced girl. Don't let my special traits stop you from meeting me! Now that they're all taken care of, I'm just like any other kitty - waiting for my forever family." 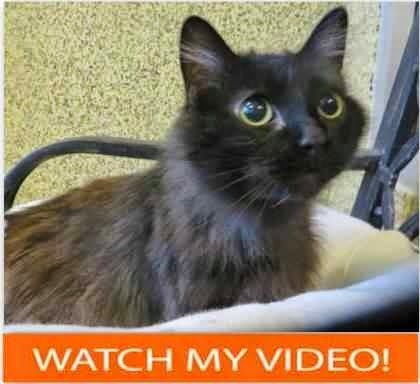 We love differently-abled cats like Camilla and we're purring she finds her forever home very soon. Camilla is available at the Merriam Campus of Great Plains SPCA! What a sweetheart Camilla is, we love her black smoke furs and sweet personality. My Human's first cat had 3 legs. We are sending Camilla our biggest purrs for her to find the right and perfect forever home where she is truly cherished for the special kitty she is. Oh, what a sweetie. Purring for Camilla's loving furever home. She's beautiful and very special. Paws crossed that she finds a home soon. Camilla sure is beautiful, and she sounds like such a sweet kitty. We'll tweet about her now! What a gorgeous girl Camilla is! I'd never know she was blind if you hadn't said it. What a little beauty. I hope there is a special home ready and waiting for a special kitty. You sound like a very special girl, Camila, and we are crossing all our paws that you find a wonderful forever home very soon! Camila is very pretty and sounds like a little love bug! I would love to have her in my home if I could. I hope she finds a wonderful home soon. She will make a wonderful kitty companion.